In 1978 there was a movie titled, “Invasion of the Body Snatchers.” It was about an alien species from another world wanting to replace our species with a duplicate copy of each individual. It didn’t make a difference if they were young or old, black or white, tall or short. A duplicate was intended for everyone. The one big difference of course is that the duplicates had no self-conscious, emotion or freedom of thought. Their personalities and beliefs were stripped away and all that remained was a facade. Today, when I see our species I sense a similar transformation has occurred. Whether they are walking on a busy sidewalk, driving a vehicle, in a theater, in a library, shopping or whatever, something has changed with the way they use their thought processes. In my mind, nothing is more ridiculous than when I see a trainee in the gym on his or her cellphone. It’s like why did you even bother to come here. Working out is serious business and needs ones complete focus, not only to achieve the maximum gains for the time a trainee spends in the gym, but to also prevent a serious injury from happening to them or someone else. 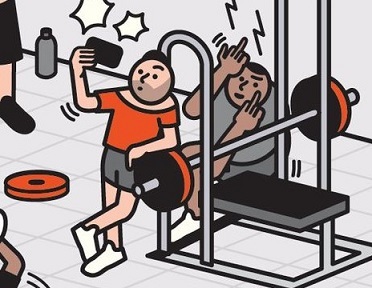 Talking, texting, or taking selfies in a gym is not only a waste of their time but rude to others that are waiting for them to get out of their way so they can do what they came to the gym to do – train. Not too long ago (before the tech boom) bodybuilders came to the gym to train like there was no tomorrow. When they walked through the gym’s doors they left the distractions of the outside world behind them. Bodybuilding was serious business back then. There were physiques to be built and super heavy weights to lift. The last thing anyone would think of is talking on a phone (if the gym had one) or stopping to take a photo. Believe me you would have been slammed against a wall for that type of BS. Unlike today, there was a harmonic vibe in the bodybuilding gyms of yesteryear. The training atmosphere in those gyms was extremely intense and everyone pushed and pulled the steel as if they were all part of a powerful engine - with all pistons firing at high speed - as everyone united together in their cause to travel on the Super Highway of Muscle. Today it’s nonstop chatter and lights, cameras, action. Everybody has a lot to say about nothing or wants to share their latest, greatest photo online. I’m mean this is Mickey Mouse stuff. They joined a gym for a reason, maybe they wanted to increase their strength or build muscle, or maybe they just wanted to lose a few pounds and become fit. I’m sure they didn’t join with the purpose in mind of blabbing on their cellphones while watching the latest viral videos on YouTube. But somewhere along the line their reason for being in the gym got diluted and before you know it out comes the cellphone. The sad thing is that cellphones in gyms have become the norm and if you don’t have one - there must be something wrong with you. The craziest is when I see a trainee on a cellphone while performing an exercise. I’ve actually seen guys and gals doing lat pull-downs, squats and similar movements while their cellphones are braced against their delts by their chins. If you ask me this sounds like a great way to destroy the vertebrae in the neck. This generation is clueless and couldn’t have survived in the 20th century gyms. Personally, I have a cellphone and have never brought it into the gym. And to be honest I rarely turn it on. Somehow, with everything I’ve got going on, I’ve been able to take care of business and live a normal life (how’s that possible). When I train it’s my time, not yours, his, or hers. The outside world, with all its distractions and drama, will be there when I’m done. So if you see me in the gym waiting for the bench your sitting on while you’re on your cellphone you’ve better get out of my way because I’ve got goals to achieve and results to realize. And believe me you won’t be the first one to hear my wrath.